Use a treadmill for a low-impact walking workout. If you prefer a low-impact walk, but don't think there is going to be flawless weather forecasted for the days ahead, try a treadmill. You can set your own pace and you don't even have to dress to impress if you've got a treadmill at home. While it's no secret that you'll burn more calories from a high-impact workout, a low-intensity walk will still increase your level of fitness, boost your bone density and help manage your weight, cholesterol and blood pressure. Head for the nearest sports store and ask for help choosing the correct footwear for treadmill walking. 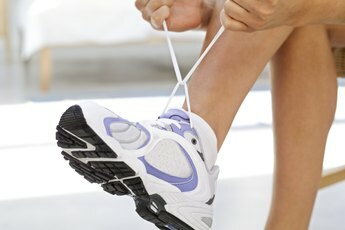 Choose walking shoes that have good arch support and a shock-absorbing sole. Even though your workout is low impact, you're still putting the whole weight of your body onto your tender tootsies when you take a step. Taking preventative measures, like buying the proper shoes to prevent injury to your tendons and joints, is worth your time and effort. Warm up by walking in place or walking at a very low setting on the treadmill for a few minutes. Increase the settings to a comfortable speed for your height, stride length and overall fitness level. You don't want to start off at 4 mph if you haven't worked out in a while, nor do you want to amble along at 2 mph while filing your nails. Set a pace that gets your heart pumping and your brow glistening with sweat. 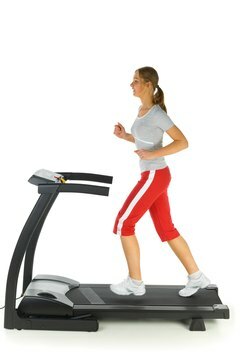 If you don't need to hang on to the handles of the treadmill, pump your arms as you walk for greater cardio benefits. Increase your endurance over time by walking further. 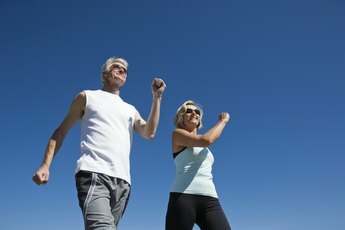 If you normally walk two miles a day on the treadmill, start adding distance every couple of weeks. Set a long-term goal to build up to a 10-mile walk by the end of the year. While it's not feasible to walk 10 miles a day if you have a busy schedule, you can promise yourself to put in the extra time at least one day a week while doing your regular walk for the rest of the days. You can also increase the intensity of your walk by alternating between your normal pace and a faster pace. Increasing the degree of incline boosts the cardio factor and can be used to spice up your workout so you don't get bored. 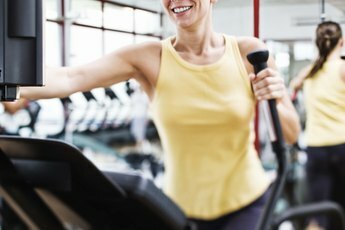 To reap the most rewards from your treadmill walking routine, stick to the CDC’s recommendation of doing at least 150 minutes of moderately intense aerobic exercise per week. This equals approximately 20 minutes on the treadmill every day of the week or 30 minutes, five days a week. 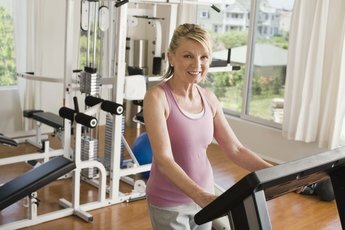 Consult your healthcare provider if you are beginning an exercise program, you have been away from fitness programs for a while, or you have chronic health issues that need special consideration when you work out.